@RoJoJr @IndianaMBB @IUHoosiers Congrats and thanks for the memories RoJo. 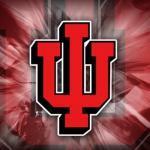 @ChronicHoosier D-day has arrived!! Romeo in candy stripes.